Since it’s tax season, I’m sure many of you are preparing to pay Uncle Sam a large sum of money in the coming weeks – I know I am. Fortunately, though, that’s not all bad! There are ways to maximize those payments and actually earn something back from them. Hopefully, that will help make the payment a little less painful. This is the first year I’ve actively looked at tax payment options, which is good… I think. The past few years I’ve been fortunate enough to get money back from the government or my amount due was low enough where it wasn’t worth using a debit/credit card to pay. In other words, I didn’t worry about maximizing my tax payment, because I didn’t need to. Sadly, this year is different; I owe the federal government about $500. That being said, the state is refunding me almost the same amount, so I get to break even and earn free points in the process! The IRS offers a few different payment methods for credit and debit cards which can be found here or in the picture below. These sites can only be used to pay federal taxes, not state. Debit and credit card options for paying the IRS. Certain programs, such as TurboTax, offer you the ability to e-pay, however, I would advise against it. The e-pay fees are much higher than the regular debit and credit card fees. You can still e-file, just avoid e-paying. There are six different websites (10 if you count the e-pay options) that allow you to pay your taxes with a debit or credit card, but some of them are better than others. 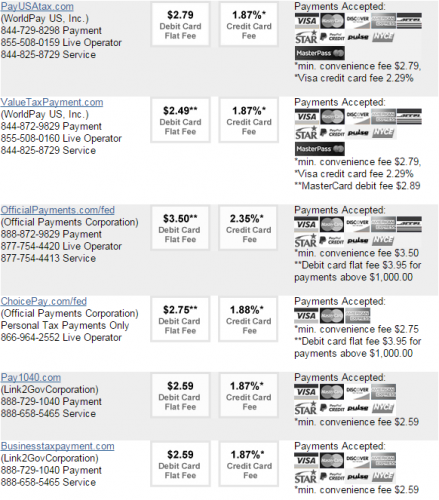 Credit Card Payments (excluding Visa) – The credit card processing fee is only 1.87%. Payment Networks – PayUSAtax is one of the only ways to pay your taxes with MasterPass. Visa Credit Card Payments – Visa credit cards come with a 2.29% fee versus the normal 1.87% fee. Debit Card Payments (excluding MasterCard) – The fee for debit card payments is only $2.49, which is the cheapest option available. Payment Networks – ValueTaxPayment is the only other way to pay your taxes with MasterPass. MasterCard Debit Card Payments – MasterCard debit card payments cost $2.89, which is the most expensive debit option out there. Debit Card Payments – The fee for debit card payments is only $2.59, which is the second cheapest option available. 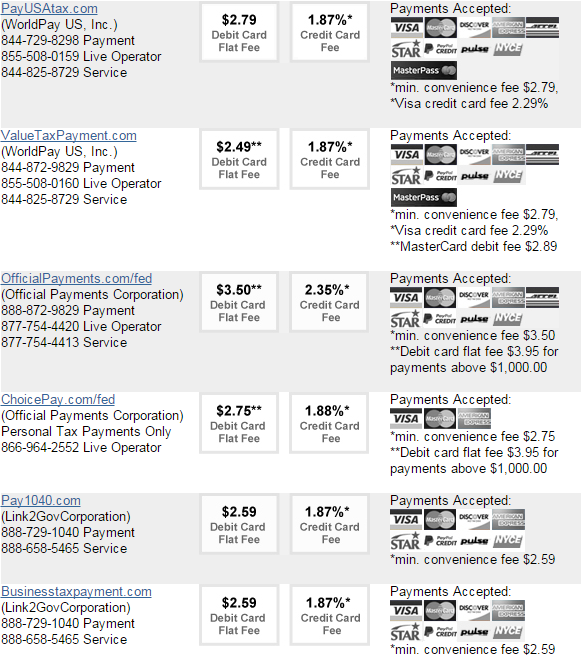 This does include MasterCard payments, though, so it’s the cheapest MasterCard option. There aren’t any bad uses for this option. Should You Use a Debit or Credit Card? Debit cards are a good choice, because there are were many point earning cards that could be used. The only points earning debit card still available is UFB Direct’s Airline Rewards checking. With that card, you earn 0.5 American Airline miles per $1 spent. There’s also the SunTrust SkyMiles debit card and the Bank of America Alaska Airlines debit card that earn miles, however, they do not accept new applications. Credit cards are a good option if you have a card earning 2% or more, since the fee on most of these websites is only 1.87%. It wouldn’t be much of a profit, but it’d be better than nothing. Paying 1.87% could also be feasible if you are trying to hit a minimum spending requirement. $500 $2.49 250 1.0 cent per point It's debatable, but I say yes. 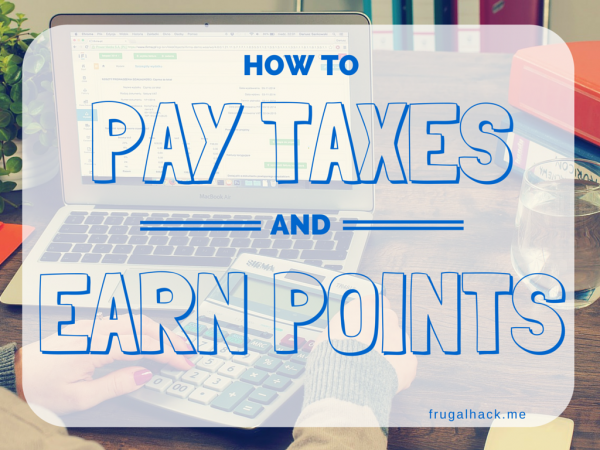 If you have a tax payment due this year, then you might as well earn points, miles, or cash back from it. However, determining whether to use a debit card or a credit card is up to you and your wallet. If you have a credit card that earns 2% or better (e.g. Discover It Miles, Amex Fidelity, Barclay Arrival+, ect.) or a debit card that earns points or miles, there’s no reason not to use them to pay your taxes!